Commentary: Lots of good ideas bubbling at new restaurant, but they’re not fully cooked. Behold the new McDonald’s flagship in Chicago! This temple of the Big Mac is billed as a model of energy-saving architecture — sustainability! It’s supposed to bring people together — community! It even aims to be visually subtle, which amounts to a revolution for a company whose stores, once decked out in ketchup red and mustard yellow, blighted America’s highways and byways. 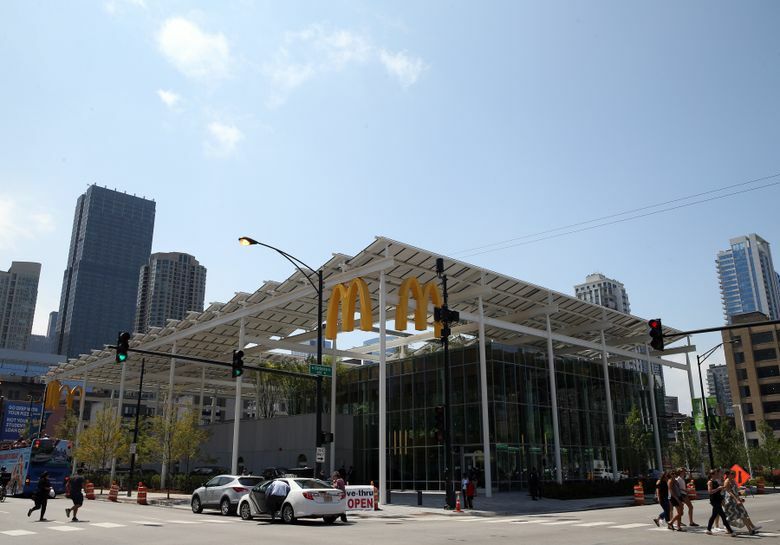 “I defy you to find another McDonald’s on Earth as beautiful as this one,” said downtown Alderman Brendan Reilly at Wednesday’s press preview. That’s a lot of hype to live up to, and the flagship restaurant that opened to the public Thursday doesn’t always deliver. The building, a white pavilion with pencil-thin steel columns, environmentally friendly timber and an array of 1,062 rooftop solar panels, is architecturally adventurous — a big improvement on the supersized, backward-looking store it replaced. Its airy, plant-showcasing interior is miles better than the plastic-heavy McDonald’s of old. Yet the flagship’s outdoor plaza isn’t nearly as inviting as it should be. And its green credentials, while impressive, are undercut by the fact that it remains tied to the energy-wasting car culture. I give this building, whose costs were largely shouldered by McDonald’s rather than franchise owner Nick Karavites, an “A” for effort and a “B” for execution. There are lots of good ideas bubbling here, but they’re not (excuse the restaurant metaphor) fully cooked. Located on the block bounded by Ohio, Ontario, Clark and LaSalle streets, the McDonald’s occupies a strange spot in Chicago — a place I once dubbed “the blurbs” for the way its blurs the line between urban charm and the tacky suburban strip. The neighbors include a gas station and a Rainforest Cafe with a hideous green frog on its roof. The original McDonald’s on this site, a low-slung affair that opened in 1983, played a leading role in this visual cacophony. Its display of rock ’n’ roll memorabilia bestowed a sheen of glamour on the grubby business of serving up burgers and fries. Affectionately nicknamed the “Rock ’n’ Roll McDonald’s,” it lasted until 2004 when it was demolished for a new outlet, an on-steroids version of the McDonald’s that Ray Kroc built in northwest suburban Des Plaines in 1955. That building and its massive Golden Arches looked backward. 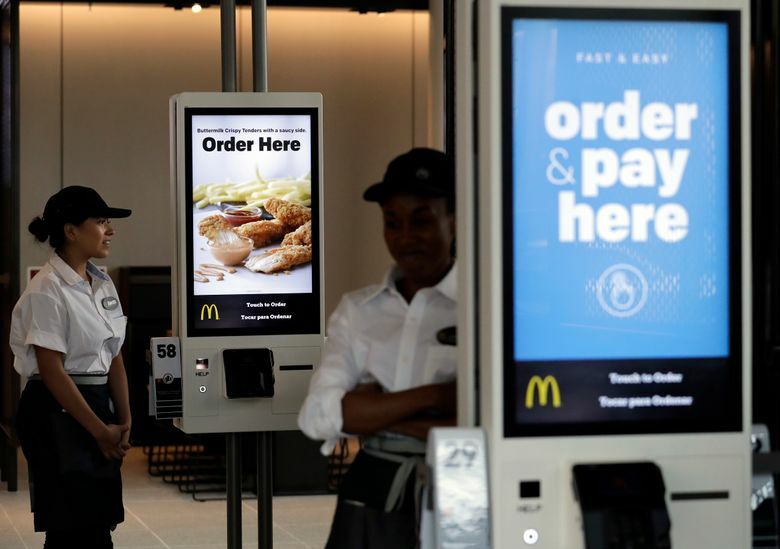 The new one, with a commendable push from McDonald’s CEO Steve Easterbrook, looks forward. The architect, Chicago’s Carol Ross Barney, is widely recognized for her work on the Chicago Riverwalk, one of the city’s finest new public spaces. It’s less widely known that Barney’s eponymous firm assisted London-based Foster + Partners on the design of the new Apple flagship store on North Michigan Avenue. Both flagships don’t just aim to project a brand identity. 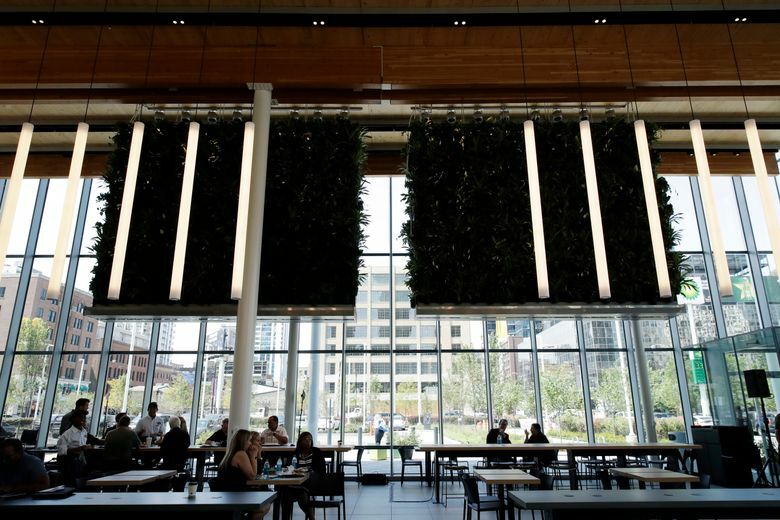 They seek to give something back to the community in the form of usable public space — a fitting gesture for McDonald’s, which in June moved its headquarters to the city’s hip Fulton Market district from the sleepy confines of west suburban Oak Brook. For Barney, the company’s directive about “community” meant striking a new balance between cars and pedestrians. She sought to create an urban oasis where people could eat, drink and meet. On the site’s west side, she got McDonald’s to cut the amount of parking by about one-third. She increased the number of trees and shrubs. She replaced ugly asphalt with permeable concrete pavers that cover the site like a gray rug, giving it the feel of an urbane outdoor plaza. Even the drive-through lanes have those pavers, making them resemble a “shared street,” where pedestrians, bikes and cars have an equal claim to the road. But the outdoor space disappoints, even though, admittedly, it’s unfinished. (Contractors still have to put in a lawn and install a big, sustainable teak table.) In contrast to the Riverwalk, there aren’t enough places to sit, apparently because local officials were concerned that homeless people would turn benches into makeshift beds. In addition, city regulations aimed at masking ugly surface parking lots from the view of passers-by required Barney to wrap much of the site with fencing and shrubs. This treatment forms a visual barrier that makes the new flagship less open and inviting. The building itself, which occupies the site’s east side, cleverly interprets McDonald’s desire to associate itself with environmental sustainability. In contrast to the sign-plastered, decoration-slathered eyesores around it, it relies on the essentials of architecture — columns and beams — to convey its message. The result is a shade-providing, energy-producing structure — a “solar pergola,” Barney calls it. Company executives expect it to meet at least 60 percent of the store’s electricity needs. To be sure, the pergola looks a little industrial from certain vantage points. (Is it a factory? A mini-power station?) It also will strike some observers as a rough-edged knockoff of the Art Institute of Chicago’s elegant Modern Wing (Barney denies any influence). And you wonder how the open-to-the-elements structure will fare when brutal winter winds blow. Still, the understated exterior, which has only six small versions of the McDonald’s arches affixed to the structure, can be deemed a success. The pergola draws together the store’s disparate elements — the kitchen and the drive-through lanes, which retain their previous location, and a new dining area — into a visually unified whole. The impressive canopy, which is in keeping with the Chicago tradition of celebrating structure, has enough oomph to stand up to ever-larger buildings rising around it. And the dining area is a little jewel, a minimalist glass box that reveals the wood structure that helps support it. At night, the transparent store and its canopy become a beacon. Continuing the environmental theme, narrow walls of plants are suspended from the ceiling. Cross-laminated timber, an advanced form of plywood that requires less energy to make than concrete or steel, supports the roof. This is said to be the first commercial use of the timber in Chicago. Barney worked on the interior with the Sydney firm of Landini Associates, which did a fine job on the appropriately modern furniture and legible layout. Like the exterior, the interior has a calm palette, consisting of cool grays and warm woods. Ketchup red is notably absent, though there are traces of mustard yellow. 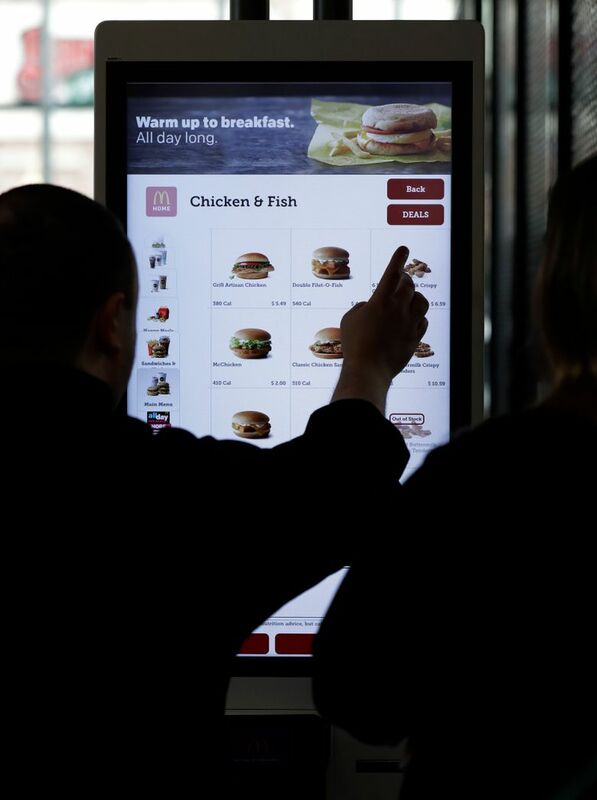 The store is a showcase in McDonald’s’ effort to convert its roughly 14,000 U.S. locations to a “experience of the future” model, featuring ordering kiosks, table service and increasing use of the mobile app. 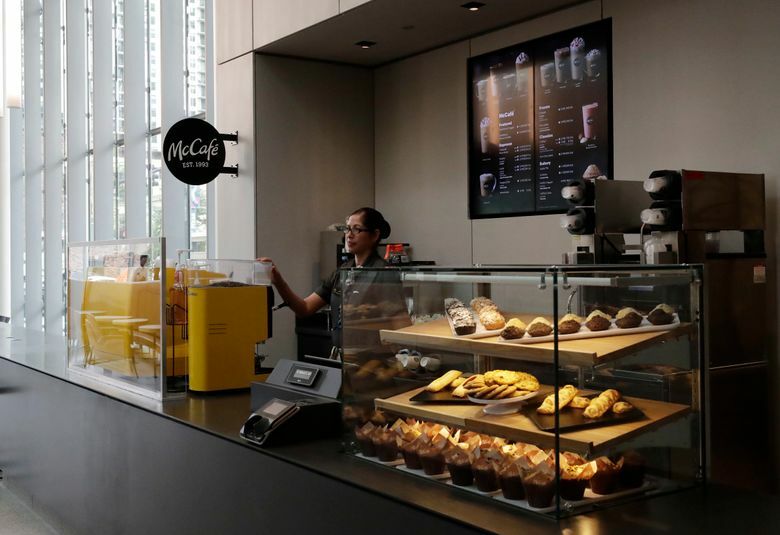 With the store expected to use half the energy of a typical restaurant, McDonald’s is seeking platinum status, the highest level in the Leadership in Energy and Environmental Design ratings, for the project. Some things don’t change, though. About half the store’s business comes from its drive-through lanes (in a typical McDonald’s, that share can be 70 percent). So while the materials and building systems of the new McDonald’s point to an environmentally enlightened future, its car-culture business model remains stuck in the past. That inconsistency doesn’t make the store an exercise in “green-washing,” a term critics use to describe buildings that are better at presenting the image of reducing energy use than actually saving it. But it does show that architecture must adapt to slowly-changing habits even as it points the way to new ones. Hurdles abound on the road to eco-utopia.